Around my twelfth or thirteenth birthday, the local ice rink where my father taught at a summer hockey camp had a few arcade cabinets in rotation. Considering how athletic, extroverted and interested in following in my dad’s footsteps I was, I had absolutely no interest in sports, but I did have about two bucks in quarters. I resolved that one evening, I was going to take my hard-scrounged change on a quest to beat one of the games. As soon as I got to the rink, I laid out seven quarters on the dashboard and dropped the last one in the slot. Time passed and some of the other kids noticed. I had progressed fairly strongly, and after a stage or two, some of them joined in. Pretty soon they were coming in and out of the game, depending on availability of their own change, my trusty-yet-expendable wingmen, the Biggses and Wedges to my Luke Skywalker. A dollar-twenty-five into the game, I’m almost at the end, and another kid asks if he can “borrow” a quarter from me. In a mix of cockiness and generosity, I tell him to go ahead. He whips a quarter from the dash and drops it in, only to die off immediately. Shortly thereafter, I reach the boss of the game and begin to struggle. I deal a fair amount of damage, but just before delivering the coup-de-grace, I run out of health. Hyped up on near-victory, I reach for another quarter, only to discover that I’ve run out. 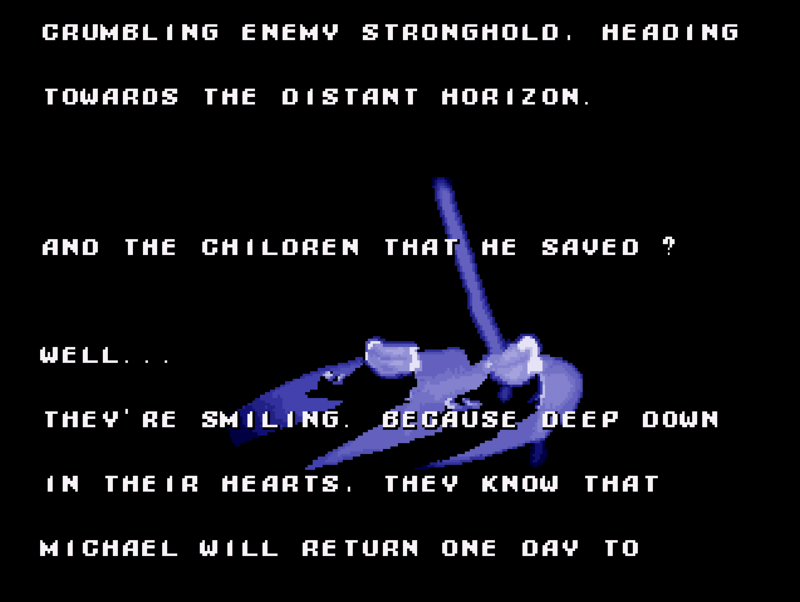 While I still encourage generosity and try to practice it when I can, I still blame it for the reason I didn’t finish Michael Jackson’s Moonwalker that day. 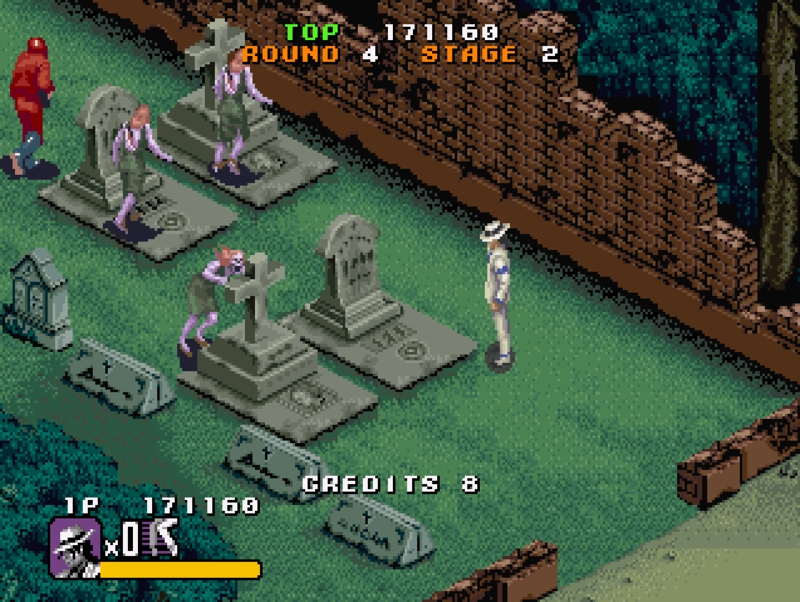 Moonwalker falls into the realm of arcade Beat-Em-Up, a classification that puts the “generic” in “genre.” Ninja Turtles, X-Men, Sailor Moon, the Simpsons–these games and others like them came to life with only a little more effort than slapping new artwork on each cabinet as it rolled off the assembly. 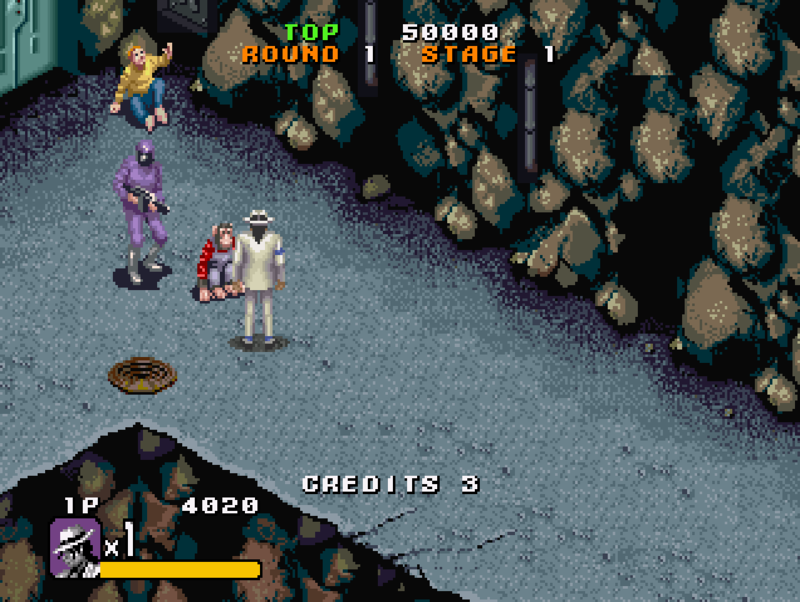 Each one consisted of characters progressing through a stage, the game periodically forcing them to a stop and assailing them with dozens of goons who may have seen what you did to the hundreds before them, but still feel they have a shot of taking you down. When you dash their hopes–and organs–the stage begins to move again. Murder, rinse, repeat. One button performs a standard attack. The other offers a limited special attack. One the surface, Moonwalker doesn’t bring anything to the table except an angled top-down perspective instead of the usual limited-3D side-scrolling. However, some interesting quirks and some unintentionally hilarious details make the game stand out from the rest. Video game music hadn’t garnered much respect at that point, but I supposed it really hadn’t earned any yet. Moonwalker, on the other hand, boasted a soundtrack entirely composed by Michael Jackson himself, including hits such as “Bad,” “Billie Jean,” “Smooth Criminal,” and of course the most obviously fitting song to underscore a graveyard stage, “Another Part of Me.” Now watch me turn my praise into a big ball of wibbly-wobbly uncertainty as I point out that if you decide to play a game because you want to hear synth-instrumental midi versions of Michael Jackson, you probably need to reevaluate your priorities. However, it stands that when facing down an army of clone games, any unusual feature might sway you to play that one against all the rest, putting aside that playing Jackson’s CDs might be the way to go. 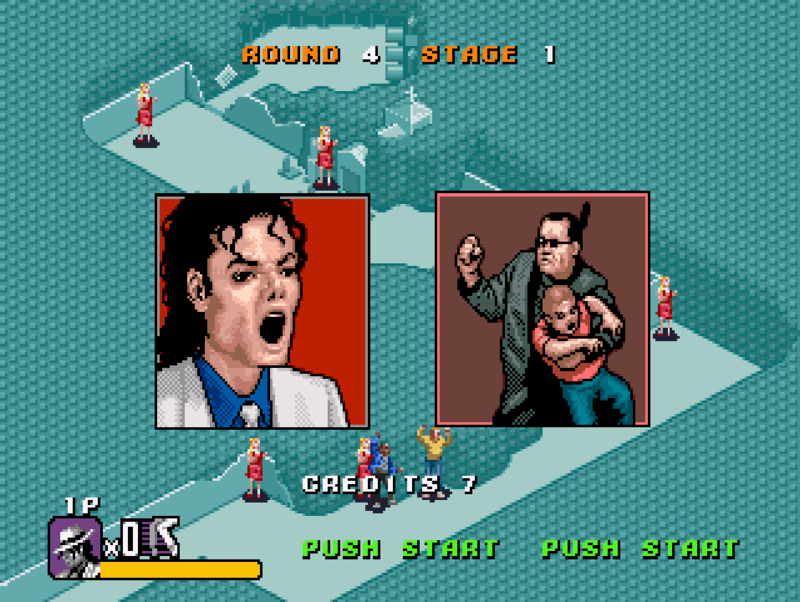 The game follows the plot of part of the Moonwalker film, where Michael sets off to rescue a bunch of children from a drug dealer. Comic-book-style panels flash before each stage, each time showing the villain struggling to restrain a kid, shaking his fist in unintentional mockery of every cartoon bad guy ever created. Michael responds with his characteristic scream, “Ow!” Then after a brief moment of WTF and a snort of laughter, you begin! Attacks come in a form of dance moves and sparkles that could flay the hide off Edward Cullen. 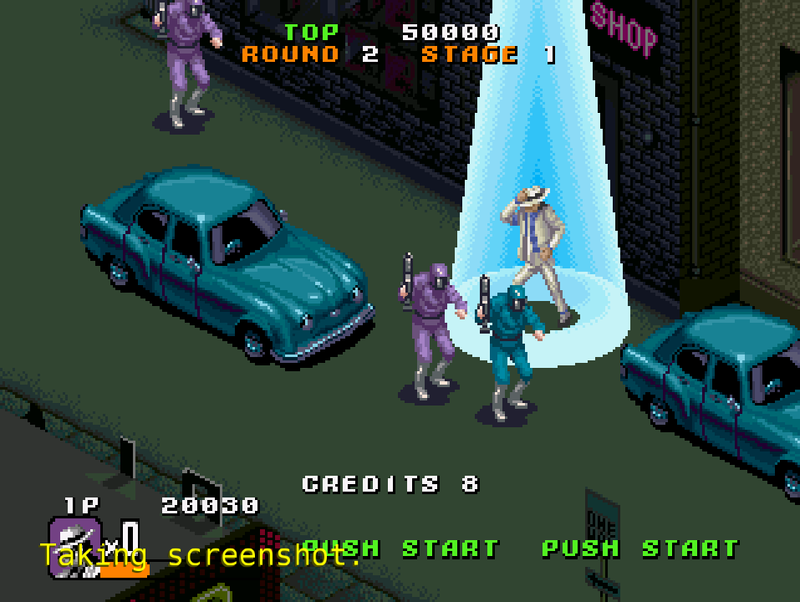 The special move puts the spotlight on Michael–literally–and alternates through three or four different moves, which involve the enemies dancing to death, bursting apart in pyrotechnics, or getting hit by meteors. As you go through the stage, the goal is to collect–er, rescue the children, who will periodically refill your health or amount of special attacks. Near the end, Bubbles the Chimp will dash out and turn you into Robo-Michael, allowing you to finish off the boss in a spray of lasers. While I can’t confirm most of that story, I do know that shortly thereafter they released Ready-to-Rumble boxing with a special character. The game takes its super-hero message seriously, which I, for one, find amusing. However, while collecting children and grabbing the monkey provide a good laugh, the main drawback of the game centers on the genre. Combat in Beat-Em-Ups is nothing if not repetitive, and it makes me vaguely conscious that Sega programmed the game at an optimal length to pry as many quarters as possibly from pre-adolescent fingers. I did, however, finally finish it.